In the search for life beyond Earth, scientists have turned up some very interesting possibilities and clues. On Mars, there are currently eight functioning robotic missions on the surface of or in orbit investigating the possibility of past (and possibly present) microbial life. Multiple missions are also being planned to explore moons like Titan, Europa, and Enceladus for signs of methanogenic or extreme life. But what about Earth’s closest neighboring planet, Venus? While conditions on its surface are far too hostile for life as we know it there are those who think it could exist in its atmosphere. In a new study, a team of international researchers addressed the possibility that microbial life could be found in Venus’ cloud tops. This study could answer an enduring mystery about Venus’ atmosphere and lead to future missions to Earth’s “Sister Planet”. 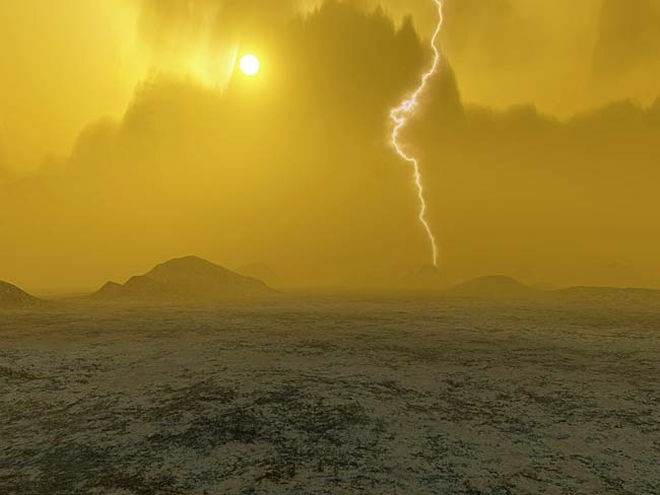 The study, titled “Venus’ Spectral Signatures and the Potential for Life in the Clouds“, recently appeared in the journal Astrobiology. The study was led by Sanjay Limaye of the University of Wisconsin-Madison’s Space Science and Engineering Center and included members from NASA’s Ames Research Center, NASA’s Jet Propulsion Laboratory, California State Polytechnic University, the Birbal Sahni Institute of Palaeosciences, and the University of Zielona Góra. For the sake of their study, the team considered the presence of UV contrasts in Venus’ upper atmosphere. These dark patches have been a mystery since they were first observered nearly a century ago by ground-based telescopes. Since then, scientists have learned that they are made up of concentrated sulfuric acid and other unknown light-absorbing particles, which the team argues could be microbial life. To illustrate the possibility that these streaks are the result of microbial life, the team considered whether or not extreme bacteria could survive in Venus’ cloud tops. For instance, the lower cloud tops of Venus (47.5 to 50.5 km above the surface) are known to have moderate temperature conditions (~60 °C; 140 °F) and pressure conditions that are similar to that of Earth at sea level (101.325 kPa). This is far more hospitable than conditions on the surface, where temperatures reach 737 K (462 C; 860 F) and atmospheric pressure is 9200 kPa (92 times that of Earth at sea level). In addition, they considered how on Earth, bacteria has been found at altitudes as high as 41 km (25 mi). On top of that, there are many cases where extreme bacteria here on Earth that could survive in an acidic environment. As Rakesh Mogul, a professor of biological chemistry at California State Polytechnic University and a co-author on the study, indicated, “On Earth, we know that life can thrive in very acidic conditions, can feed on carbon dioxide, and produce sulfuric acid.” This is consistent with the presence of micron-sized sulfuric acid aerosols in Venus upper atmosphere, which could be a metabolic by-product. In addition, the team also noted that according to some models, Venus had a habitable climate with liquid water on its surface for as long as two billion years – which is much longer than what is believed to have occurred on Mars. In short, they speculate that life could have evolved on the surface of Venus and been swept up into the atmosphere, where it survived as the planet experienced its runaway greenhouse effect. This study expands on a proposal originally made by Harold Morowitz and famed astronomer Carl Sagan in 1967 and which was investigated by a series of probes sent to Venus between 1962 and 1978. While these missions indicated that surface conditions on Venus ruled out the possibility of life, they also noted that conditions in the lower and middle portions of Venus’ atmosphere – 40 to 60 km (25 – 27 mi) altitude – did not preclude the possibility of microbial life. For years, Limaye has been revisiting the idea of exploring Venus’ atmosphere for signs of life. The inspiration came in part from a chance meeting at a teachers workshop with Grzegorz Slowik – from the University of Zielona Góra in Poland and a co-author on the study – who told him of how bacteria on Earth have light-absorbing properties similar to the particles that make up the dark patches observed in Venus’ clouds. While no probe that has sampled Venus’ atmosphere has been capable of distinguishing between organic and inorganic particles, the ones that make up Venus’ dark patches do have comparable dimensions to some bacteria on Earth. According to Limaye and Mogul, these patches could therefore be similar to algae blooms on Earth, consisting of bacteria that metabolizes the carbon dioxide in Venus’ atmosphere and produces sulfuric acid aerosols. In the coming years, Venus’ atmosphere could be explored for signs of microbial life by a lighter than air aircraft. One possibility is the Venus Aerial Mobil Platform (VAMP), a concept currently being researched by Northrop Grumman (shown above). Much like lighter-than-air concepts being developed to explore Titan, this vehicle would float and fly around in Venus’ atmosphere and search the cloud tops for biosignatures. Another possibility is NASA’s possible participation in the Russian Venera-D mission, which is currently scheduled to explore Venus during the late 2020s. This mission would consist of a Russian orbiter and lander to explore Venus’ atmosphere and surface while NASA would contribute a surface station and maneuverable aerial platform. Another mystery that such a mission could explore, which has a direct bearing on whether or not life may still exist on Venus, is when Venus’ liquid water evaporated. In the last billion years or so, the extensive lava flows that cover the surface have either destroyed or covered up evidence of the planet’s early history. By sampling Venus’ clouds, scientists could determine when all of the planet’s liquid water disappeared, triggering the runaway greenhouse effect that turned it into a hellish landscape. NASA is currently investigating other concepts to explore Venus’ hostile surface and atmosphere, including an analog robot and a lander that would use a Sterling engine to turn Venus’ atmosphere into a source of power. And with enough time and resources, we might even begin contemplating building floating cities in Venus atmosphere, complete with research facilities. 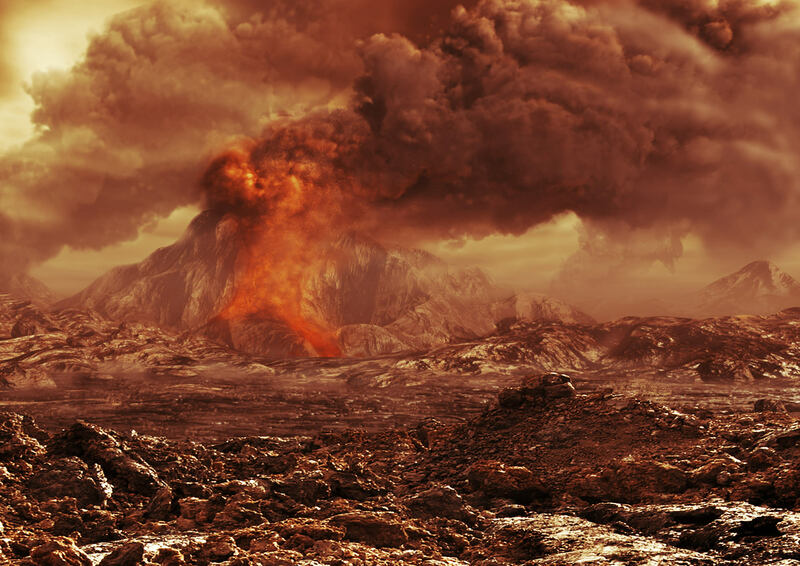 The weather on Venus is like something out of Dante’s Inferno. The average surface temperature – 737 K (462 °C; 864 °F) – is hot enough to melt lead and the atmospheric pressure is 92 times that of Earth’s at sea level (9.2 MPa). For this reason, very few robotic missions have ever made it to the surface of Venus, and those that have did not last long – ranging from about 20 minutes to just over two hours. Hence why NASA, with an eye to future missions, is looking to create robotic missions and components that can survive inside Venus’ atmosphere for prolonged periods of time. These include the next-generation electronics that researchers from NASA Glenn Research Center (GRC) recently unveiled. These electronics would allow a lander to explore Venus surface for weeks, months, or even years. In the past, landers developed by the Soviets and NASA to explore Venus – as part of the Venera and Mariner programs, respectively – relied on standard electronics, which were based on silicon semiconductors. These are simply not capable of operating in the temperature and pressure conditions that exist on the surface of Venus, and therefore required that they have protective casings and cooling systems. Naturally, it was only a matter of time before these protections failed and the probes stopped transmitting. The record was achieved by the Soviets with their Venera 13 probe, which transmitted for 127 minutes between its descent and landing. Looking ahead, NASA and other space agencies want to develop probes that can gather as much information as they can on Venus’s atmosphere, surface, and geological history before they time out. To do this, a team from NASA’s GRC has been working to develop electronics that rely on silcon carbide (SiC) semiconductors, which would be capable of operating at or above Venus’ temperatures. Recently, the team conducted a demonstration using the world’s first moderately-complex SiC-based microcircuits, which consisted of tens or more transistors in the form of core digital logic circuits and analog operation amplifiers. These circuits, which would be used throughout the electronic systems of a future mission, were able to operate for up to 4000 hours at temperatures of 500 °C (932 °F) – effectively demonstrated that they could survive in Venus-like conditions for prolonged periods. These tests took place in the Glenn Extreme Environments Rig (GEER), which simulated Venus’ surface conditions, including both the extreme temperature and high pressure. Back in April of 2016, the GRC team tested a SiC 12-transistor ring oscillator using the GEER for a period of 521 hours (21.7 days). During the test, they raised they subjected the circuits to temperatures of up to 460 °C (860 °F), atmospheric pressures of 9.3 MPa and supercritical levels of CO² (and other trace gases). Throughout the entire process, the SiC oscillator showed good stability and kept functioning. This test was ended after 21 days due to scheduling reasons, and could have gone on much longer. Nevertheless, the duration constituted a significant world record, being orders of magnitude longer than any other demonstration or mission that has been conducted. Similar tests have shown that ring oscillator circuits can survive for thousands of hours at temperatures of 500 °C (932 °F) in Earth-air ambient conditions. Such electronics constitute a major shift for NASA and space exploration, and would enable missions that were previously impossible. NASA’s Science Mission Direction (SMD) plans to incorporate SiC electronics on their Long-Life In-situ Solar System Explorer (LLISSE). A prototype is currently being developed for this low-cost concept, which would provide basic, but highly valuable scientific measures from the surface of Venus for months or longer. Other plans to build a survivable Venus explorer include the Automaton Rover for Extreme Environments (AREE), a “steampunk rover” concept that relies on analog components rather than complex electronic systems. Whereas this concepts seeks to do away with electronics entirely to ensure a Venus mission could operate indefinitely, the new SiC electronics would allow more complex rovers to continue operating in extreme conditions. Beyond Venus, this new technology could also lead to new classes of probes capable of exploring within gas giants – i.e. Jupiter, Saturn, Uranus and Neptune – where temperature and pressure conditions have been prohibitive in the past. But a probe that relies on a hardened shell and SiC electronic circuits could very well penetrate deep into the interior of these planets and reveal startling new things about their atmospheres and magnetic fields. The surface of Mercury could also be accessible to rovers and landers using this new technology – even the day-side, where temperatures reach a high of 700 K (427 °C; 800 °F). Here on Earth, there are plenty of extreme environments that could now be explored with the help of SiC circuits. For example, drones equipped with SiC electronics could monitor deep-sea oil drilling or explore deep into the Earth’s interior. There are also commercial applications involving aeronautical engines and industrial processors, where extreme heat or pressure traditionally made electronic monitoring impossible. Now such systems could be made “smart”, where they are capable of monitoring themselves instead of relying on operators or human oversight. With extreme circuits and (someday) extreme materials, just about any environment could be explored. Maybe even the interior of a star! The Advanced Lithium Ion Venus Explorer (ALIVE), derived from the COMPASS final report (2016). Credit: Oleson, Steven R., and Michael Paul. Further help came from the Glenn Research Center’s COMPASS lab, were engineers from multiple disciplines performs integrated vehicle systems analyses. From all of this, a mission concept known as the Advanced Lithium Venus Explorer (ALIVE) was developed. With the help of Steven Oleson – the head of GRC’s COMPASS lab – Paul and his team envision a mission where a lander would reach the surface of Venus and study it for 5 to 10 days. Focusing the camera lens, I wondered how long it took the drops’ light to reach my eye. Since I was only about six inches away and light travels at 186,000 miles per second or 11.8 inches every billionth of a second (one nanosecond), the travel time amounted to 0.5 nanoseconds. Darn close to simultaneous by human standards but practically forever for positronium hydride, an exotic molecule made of a positron, electron and hydrogen atom. The average lifetime of a PsH molecule is just 0.5 nanoseconds. In our everyday life, the light from familiar faces, roadside signs and the waiter whose attention you’re trying to get reaches our eyes in nanoseconds. But if you happen to look up to see the tiny dark shape of a high-flying airplane trailed by the plume of its contrail, the light takes about 35,000 nanoseconds or 35 microseconds to travel the distance. Still not much to piddle about. The space station orbits the Earth in outer space some 250 miles overhead. During an overhead pass, light from the orbiting science lab fires up your retinas 1.3 milliseconds later. In comparison, a blink of the eye lasts about 300 milliseconds (1/3 of a second) or 230 times longer! Light time finally becomes more tangible when we look at the Moon, a wistful 1.3 light seconds away at its average distance of 240,000 miles. To feel how long this is, stare at the Moon at the next opportunity and count out loud: one one thousand one. Retroreflecting devices placed on the lunar surface by the Apollo astronauts are still used by astronomers to determine the moon’s precise distance. They beam a laser at the mirrors and time the round trip. 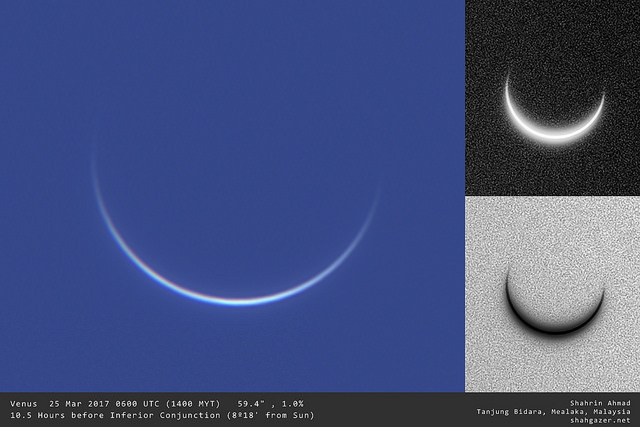 Of the eight planets, Venus comes closest to Earth, and it does so during inferior conjunction, which coincidentally occurred on March 25. On that date only 26.1 million miles separated the two planets, a distance amounting to 140 seconds or 2.3 minutes — about the time it takes to boil water for tea. Mars, another close-approaching planet, currently stands on nearly the opposite side of the Sun from Earth. With a current distance of 205 million miles, a radio or TV signal, which are both forms of light, broadcast to the Red Planet would take 18.4 minutes to arrive. Now we can see why engineers pre-program a landing sequence into a Mars’ probe’s computer to safely land it on the planet’s surface. Any command – or change in commands – we might send from Earth would arrive too late. Once a lander settles on the planet and sends back telemetry to communicate its condition, mission control personnel must bite their fingernails for many minutes waiting for light to limp back and bring word. Before we speed off to more distant planets, let’s consider what would happen if the Sun had a catastrophic malfunction and suddenly ceased to shine. No worries. At least not for 8.3 minutes, the time it takes for light, or the lack of it, to bring the bad news. Light from Jupiter takes 37 minutes to reach Earth; Pluto and Charon are so remote that a signal from the “double planet” requires 4.6 hours to get here. That’s more than a half-day of work on the job, and we’ve only made it to the Kuiper Belt. Let’s press on to the nearest star(s), the Alpha Centauri system. If 4.6 hours of light time seemed a long time to wait, how about 4.3 years? If you think hard, you might remember what you were up to just before New Year’s Eve in 2012. About that time, the light arriving tonight from Alpha Centauri left that star and began its earthward journey. To look at the star then is to peer back in time to late 2012. But we barely scrape the surface. Let’s take the Summer Triangle, a figure that will soon come to dominate the eastern sky along with the beautiful summer Milky Way that appears to flow through it. Altair, the southernmost apex of the triangle is nearby, just 16.7 light years from Earth; Vega, the brightest a bit further at 25 and Deneb an incredible 3,200 light years away. We can relate to the first two stars because the light we see on a given evening isn’t that “old.” Most of us can conjure up an image of our lives and the state of world affairs 16 and 25 years ago. But Deneb is exceptional. Photons departed this distant supergiant (3,200 light years) around the year 1200 B.C. during the Trojan War at the dawn of the Iron Age. That’s some look-back time! One of the most distant naked eye stars is Rho Cassiopeiae, yellow variable some 450 times the size of the Sun located 8,200 light years away in the constellation Cassiopeia. Right now, the star is near maximum and easy to see at nightfall in the northwestern sky. Its light whisks us back to the end of the last great ice age at a time and the first cave drawings, more than 4,000 years before the first Egyptian pyramid would be built. This is the digital message (annotated here) sent by Frank Drake to M13 in 1974 using the Arecibo radio telescope. On and on it goes: the nearest large galaxy, Andromeda, lies 2.5 million light years from us and for many is the faintest, most distant object visible with the naked eye. To think that looking at the galaxy takes us back to the time our distant ancestors first used simple tools. Light may be the fastest thing in the universe, but these travel times hint at the true enormity of space. Let’s go a little further. On November 16, 1974 a digital message was beamed from the Arecibo radio telescope in Puerto Rico to the rich star cluster M13 in Hercules 25,000 light years away. 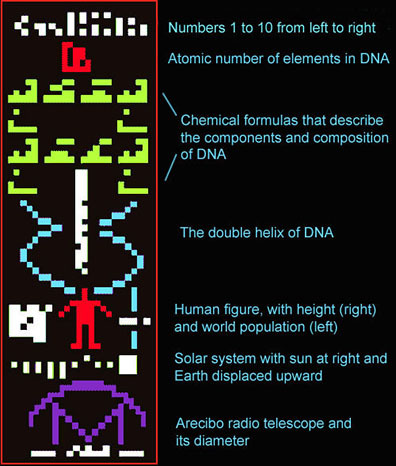 The message was created by Dr. Frank Drake, then professor of astronomy at Cornell, and contained basic information about humanity, including our numbering system, our location in the solar system and the composition of DNA, the molecule of life. It consisted of 1,679 binary bits representing ones and zeroes and was our first deliberate communication sent to extraterrestrials. Today the missive is 42 light years away, just barely out the door. Let’s end our time machine travels with the most distant object we’ve seen in the universe, a galaxy named GN-z11 in Ursa Major. We see it as it was just 400 million years after the Big Bang (13.4 billion years ago) which translates to a proper distance from Earth of 32 billion light years. The light astronomers captured on their digital sensors left the object before there was an Earth, a Solar System or even a Milky Way galaxy! Thanks to light’s finite speed we can’t help but always see things as they were. You might wonder if there’s any way to see something right now without waiting for the light to get here? There’s just one way, and that’s to be light itself. From the perspective of a photon or light particle, which travels at the speed of light, distance and time completely fall away. Everything happens instantaneously and travel time to anywhere, everywhere is zero seconds. In essence, the whole universe becomes a point. Crazy and paradoxical as this sounds, the theory of relativity allows it because an object traveling at the speed of light experiences infinite time dilation and infinite space contraction. Just something to think about the next time you meet another’s eyes in conversation. Or look up at the stars.